Senior Ethiopian and Eritrean military officials are meeting on Wednesday in Kenya for critical talks on the settlement of their long running border dispute. The two countries fought a bitter war that was sparked off by the dispute, costing some 100,000 lives. Ethiopia and Eritrea committed themselves to allowing an international tribunal decide where the border ran, when they signed the peace agreement that ended the war in December 2000. The ruling was given last year, and demarcation of the border which is supposed to begin next month has run into difficulties. Major General Robert Gordon, the head of the UN troops maintaining the peace along the Ethiopian - Eritrean border, will chair the talks. Much is riding on their outcome. Although the permanent court of arbitration has ruled on where the border lies, there is every indication that the process is in danger of stalling. 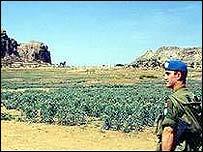 The border town of Badme, which was the scene of the clash that escalated into war, was awarded to Eritrea. But Ethiopia has made it clear that it is deeply dissatisfied with the outcome. 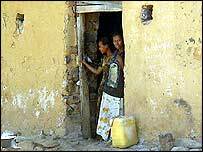 The international community has suggested that there be some compromise on the issue, but Eritrea has dug in its heals, demanding its rights. UN Secretary General Kofi Annan has warned that troops are needed for other African peacekeeping operations and cannot remain in the Horn of Africa indefinitely. But at present there is little sign that either side is willing to back down.